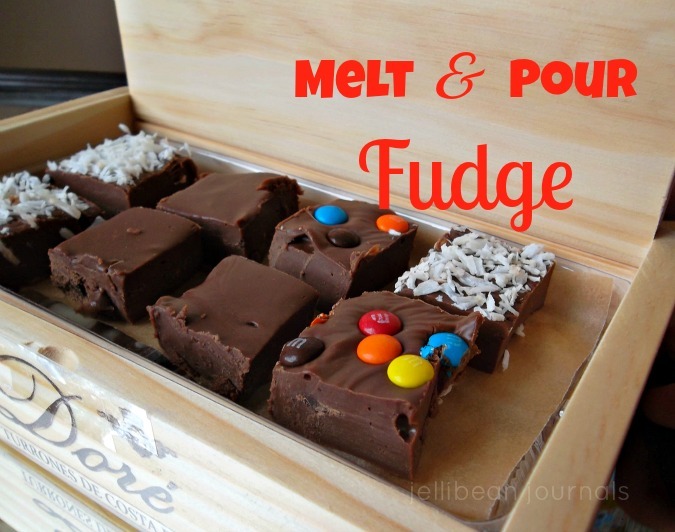 Melt and pour fudge has been in my recipe arsenal from the inception of my recipe arsenal. Years ago I clipped this recipe from a teen magazine, probably next to a page highlighting Taylor Hanson…likely the reason I picked up the mag in the first place. This is the easiest most fool-proof fudge recipe ever and delivers mouthwatering creamy chocolate results every time. Melt and pour fudge has been my favorite fudge recipe for more than 12 years, so it’s high time I share it with you. Melt 1 T. butter over low heat in a saucepan. Add chips, sweetened condensed milk, and salt. Stir constantly until everything is melted. Stir in vanilla. Use remaining butter to grease a 9x12" baking dish and use a spatula to pour all the fudge into the dish. Spread evenly. If desired, top with nuts, coconut, mini chocolate pieces or cookie crumbs and cover with cellophane or aluminum foil. Refrigerate 2 hours before slicing into 24 bite-sized pieces. I’ve always been a fudge lover, and a bit of a snob about it too, if we’re being honest. Grainy fudge, nutty fudge, and fudge of unusual flavor combos don’t interest me much. I love mine in pure, unadulterated chocolate form. Of course, a sprinkling of M&Ms never hurt anything either. Take this chocolate fudge to your next New Year’s party and your friends will love you even more. Just be sure to stash a few pieces of fudge at home for yourself, because this candy goes fast! That looks amazing! I am not normally the biggest fudge lover, but I gave some out as stocking stuffers, and I was just wishing I had saved myself a piece! I may have to try this!! It really is fantastic. Since my husband’s still away on his missions trip (until Sat.) I just took a plate of this fudge over to the neighbors to spare myself from eating it all. If you have friends who like fudge, it’s definitely worth a shot. Even if you’re not the biggest fudge fan, they’ll be happy to take it! Thanks for visiting, Erika. Mmmm…your fudge looks absolutely delicious and I love how easy and versatile it is. Definitely going to have to give it a try! I hope you love it, Jenn. If you’re a chocolate kinda girl like me, you’ll flip for how easy AND how yummy it is. Enjoy! Thanks Jelli! I will be making this for our New Years Eve bonfire. I’m sure it will be a hit!! That sounds great, Lisa! Just don’t let it get too close to the fire 😉 The idea of a New Years bonfire sounds lovely. It’d sure beat the loud neighbors here setting off fireworks into the wee hours of the morning. Here’s hoping our family finds a retreat this year. Have a great holiday! Thanks, Amy. I’m a fudge lover too, though to be honest I almost never eat it except around Christmastime. Thanks for stopping by this weekend! Visiting from Super Sunday Sync. I just did, hehe. Amazingly, it’s been nearly a week in my fridge and I still haven’t devoured the entire pan. I’m sure you’d love it, Rosey. Thanks for visiting. Yay! Thanks, Kristi! I really appreciate it. Love joining you on Mondays. Is this a Costa Rican dessert? I came across this recipe from a google image search. I thought the site was very interesting and inviting so I decided to give the recipe a try. It was worth it. They taste delicious and look picture perfect. I don’t usually leave comments, but I had to send praise and thanks. Happy Holidays and thank you for the recipe post! Saph, I’m so glad you liked the fudge. It’s definitely a pleaser! This year I made it adding Oreo bits and peppermint extract to amp it up a little. SO worth it. 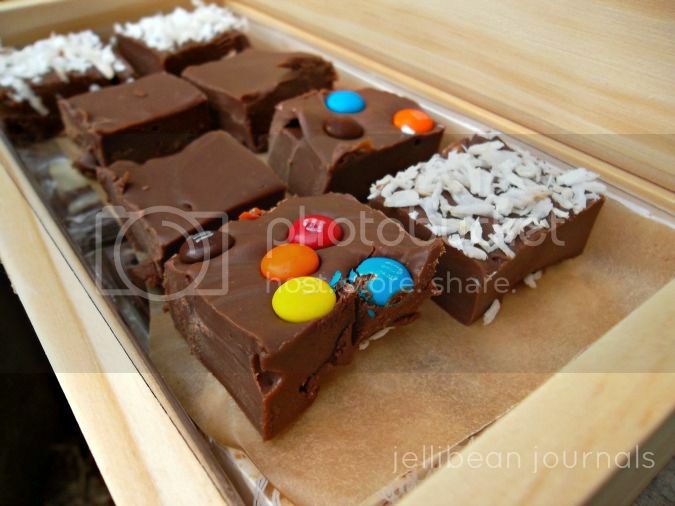 Thank you so much for taking time out of your busy day to share how you liked the fudge!